Incandescent was my submission for the fourth qualifying round of the Last Photographer Standing competition. The theme for this shot was Artificial and when I conceived of this shot I was thinking about using artificial light to mimic the sun. This shot, ironically, uses no artificial light. When I went to shoot it, I brought a flash with me in case I needed it to bring out the stem of the bulb, but (as I hoped it would) it turned out to be unnecessary. 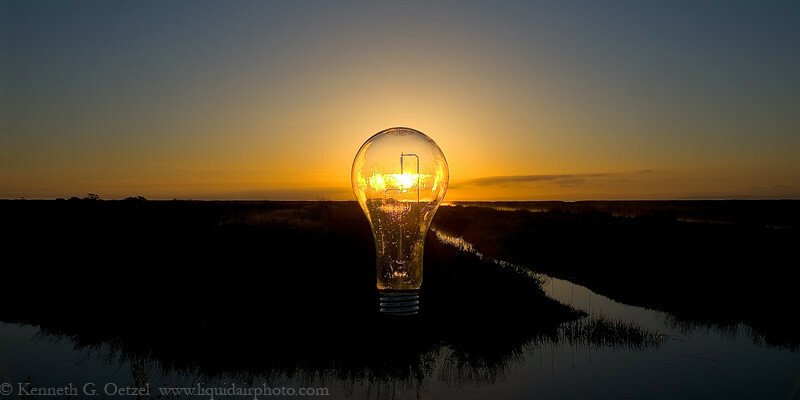 The key concept behind this shot was realizing how the bulb would look in front of the sunrise. Where it is below the horizon, the stem stands out because reflects the sky which is brighter than the horizon. Where it is above the horizon the edges of the bulb (most noticeable at the top) appear dark because they refract in the darker parts of the sky. There were two effects I didn't plan on. The first is that the glass the bulb is made from is very thin so I got less refraction that I was hoping for. The second is that the glass of the bulb is no where near optical quality so I got a lot of scatter from scratched and such creating a bunch of unanticipated highlights. Luckily the scatter prevented the glass from vanishing in places where the refraction was insufficient. The set up for this shot was a combination of planning and luck. To figure out where and when to shoot I determined the time and location of sunrise by looking first at the USNO website and SunPosition.net. The SunPosition.net site has a somewhat strange list of possible locations to choose from, but the results are somewhat simpler to use because they can be adjusted for DST and magnetic north. On a side note, a compass has now earned a permanent location in my main camera bag. Knowing where sunrise is going to be in advance helps a great deal when scouting possible shooting locations and I would much rather scout in midday rather than at 5:30AM. The major bit of luck in this shot was that the first morning I set the alarm clock for 5:00AM I got a reasonable sunrise for the shot. The actual setup was pretty simple. 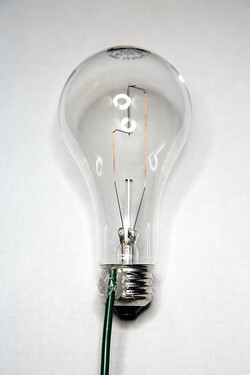 I used hot melt glue to attach some 10 gauge electrical wire to the thread on the bulb. The wire was attached to a light stand which made it easy to raise and lower the bulb. The glue attachment point was placed behind the bulb and the small bit of wire showing in the shot was barely noticeable to begin with and trivial to remove in Photoshop. The other bit of prep for this shot meant studying a depth of field chart to figure out how to set up and where to focus (this shot is a classic example of hyperfocal focusing). I find it is best to use the DoF chart as a starting point and directly test the lens to determine the closest focus point where infinity is acceptably sharp. Before I set out on my expedition, I knew exactly where I was going to place the focus ring and how far away to place the light bulb from the camera. The final subtlety about this shot is that the scene has enormous dynamic range. I knew I wanted the reflected light on the threads to show up without severely blowing out the sun. I figured in advance that this was going to require an HDR and it did; the final shot was a blend of 4 exposures using the Photoshop HDR action. In the end I deliberately let the sun blow out a little bit because it made it look brighter and better set the tone for an otherwise very dark shot. I'm using editing tools very often, if you want to know some interesting tips and trick about using this software it will be useful for you to read this guide http://softwarehdr.com/ to improve your skills and know more about it.